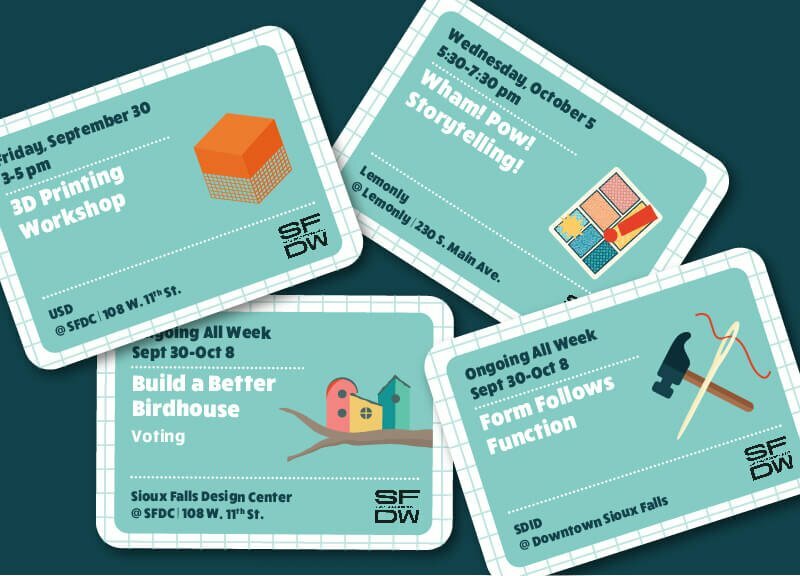 Sioux Falls Design Week is a celebration of all things design in our community—a place where architects, landscape designers, fashion designers, graphic designers and more can all bump elbows and explore the latest trends in their industries. MJM had an opportunity to help with the event design and promotion. Since it started in 2014, Design Week has had good traction among the design-savvy in downtown Sioux Falls. But this year, they wanted to increase their efforts to reach out to the wider Sioux Falls community. 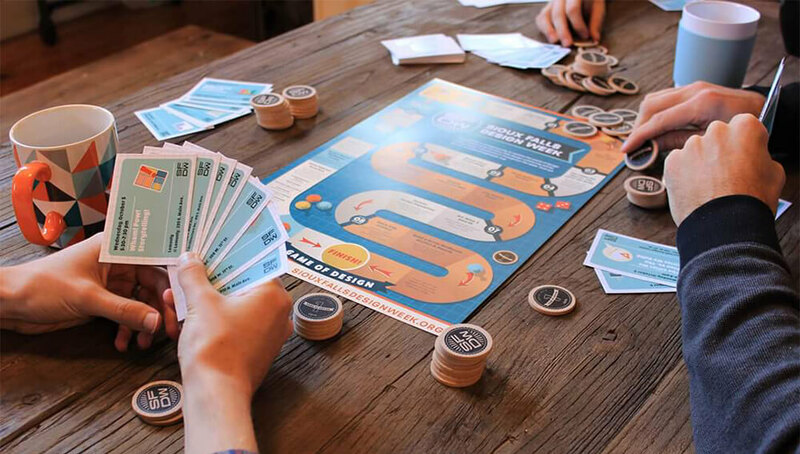 When the Sioux Falls Design Center approached MJM with this problem, we decided to speak in a design language that anyone with a basement rec room could relate to: board games! The process of designing something can often feel like a game—with bursts of creative inspiration that move you forward, niggling practicalities that move you backwards and trains of thought that bring you right back to where you started. Design can often feel like a game—with bursts of creative inspiration that move you forward, niggling practicalities that move you backwards and trains of thought that bring you right back to where you started. We hoped this metaphor would help demystify the design process and provide a welcome mat for anyone interested in learning more about design. We also just thought it would be really fun (which it was). The great thing about Sioux Falls Design Week is that it brings together design-minded folks from several different disciplines; the tricky thing is finding a way to unite all of these entities under a single umbrella. This year’s line-up included everything from parklets to 3D printing to dresses made from construction materials. To allow for both specificity and uniformity, we created playing cards with a unique illustration for each event. The business or organization hosting the event could hand these out to customers, colleagues or anyone else who might be interested. This gave the hosts a chance to promote their own events while also providing an opportunity for the Design Center to reach beyond their existing audience base. Another challenge for this event design was the poster, which also served as a guide for the entire week. We organized the events into a game board, allowing viewers to follow the path of events from start to finish. These colorful and playful posters were hung up all over town, hopefully inviting viewers to take a spin through the game of design. To make the week’s events as accessible as possible, we presented the schedule in an eye-catching, easy-to-understand format. 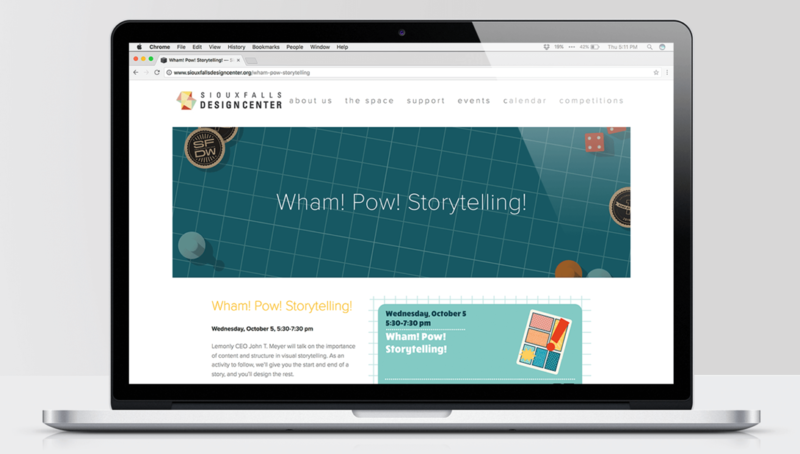 Since one of our objectives was to reach an audience throughout Sioux Falls (beyond the immediate design community) we wanted to make the events easy to share on social media. We created an overview page that showcased each of the events, as well as a unique page for each event, with cover photos that were optimized to be pulled into social media feeds, and links to directions or more information where appropriate. Those event pages could then be used to promote the events, and once the events were done they could serve as an archive of materials and ideas for future Design Week organizers. Aside from just promoting the event, we wanted to find a way to keep people engaged throughout the week and cross-pollinate between events. We took a page from the board game handbook and created wooden tokens that would be given out at the end of each event. The more events you attend, the more tokens you receive. Attendees could exchange tokens for swag donated by event hosts and friends of the Design Center. They could even take a gamble and double their tokens (or, conversely, lose them all) by guessing a number. Like with most games, it was more about the thrill of playing than the reward. Sioux Falls Design Week gave MJM an opportunity to play with some of our favorite things: event design, board games and extended metaphors. We thoroughly enjoyed the process from start to finish and hopefully we encouraged others to join in on the fun along the way.